Who Do You Think That I Am? Greetings in Christ our Lord! I hope all is well with you. Let me share God’s providence in my life. I am serving the Lord among my local indigenous people whom the Lord has entrusted me. In Nepal, there are resources needed that allows the Gospel work to be more effective. One of these resources is a reliable source of transportation. For the past couple of years I have been struggling with an old motorcycle. I am constantly repairing it, which is very expensive for me. The cost was high and hard to manage with my budget. I was not able to afford a new one. I have been praying that the Lord would meet this need, so that His work would not be hindered. I was trusting in the Lord, because I know that He is our Provider. 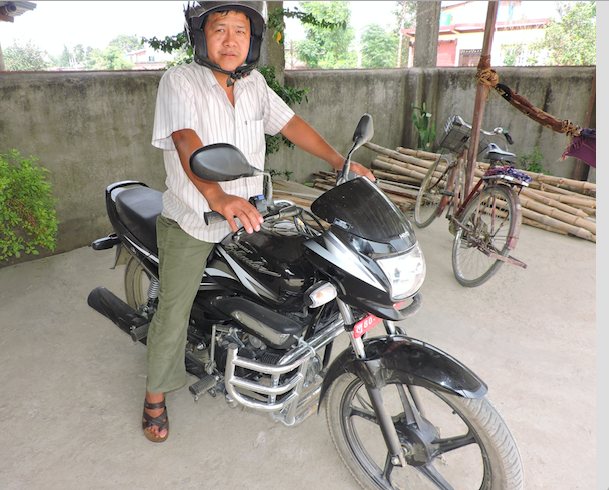 I praise the Lord that He answered my prayer and provided me with a new motorbike. I am very thankful to the Lord, HeartCry, and to all the donors for their generosity. This new motorcycle will be very helpful to my family, and in the Gospel work. For from Him and through Him and to Him are all things. To Him be glory forever. Amen. Rom 11:36. PO BOX 3506 Radford, VA 24143-3506.